So I’ve spent my summer traveling, “baking” (see all the raw posts), and doing a little bit of math. More specifically, I’ve been reading A Primer on Mapping Class Groups, by Benson Farb and Dan Margalit, with my friends Ellie and Mike. Remember how I had that post introducing the curve complex? And the second one? Well, I thought we’d delve just an eensy bit deeper into that and prove something with some fun topological methods! Usually we’re happier when graphs are connected. The one on the left is being silly and contrary. Notice that the 1-connected graph is NOT 2-connected, because if you remove the red vertex and all the edges leading to it, you end up with 2 components. Whereas in the 2-connected graph, removing any one vertex doesn’t disconnected the graph. This was a tiny tangent, as we don’t need n-connectivity right now (who knows, we might use it in the future of this blog! There’s lots of math out there!) We’re focusing on 1-connectivity. 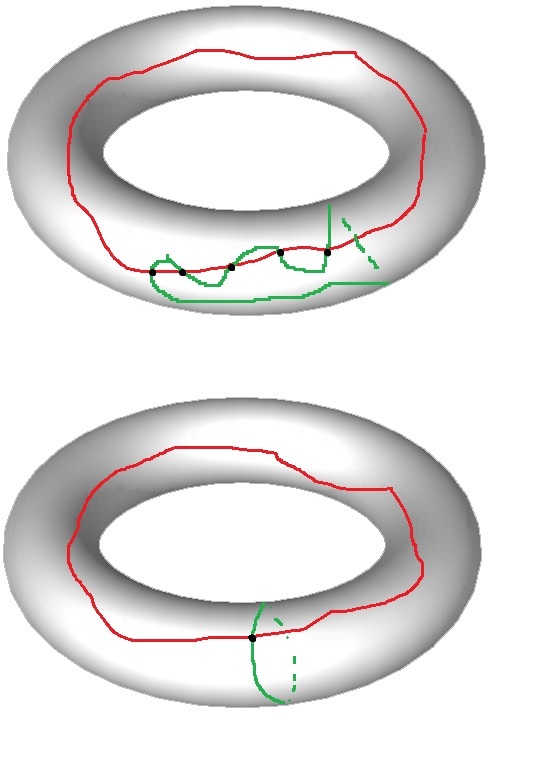 So we’re proving that the aforementioned curve complex is connected (there are a couple of exceptions to this, by which I mean this statement is true for almost all surfaces but there’s like 5 times when it’s not. I’ll talk about those later). That means that if you hand me two vertices from the curve complex, I should be able to find a path between them. So, looking at our surface, that means if you hand me two closed curves x and y on a surface, I should be able to find a sequence of curves such that , and are disjoint. Let’s say you’re being silly and you hand me an x and y that are already disjoint. Then we’re done! Theorem proved, right? Obviously not, because what if you hand me an x and y that aren’t disjoint? What then, you ask me? Well, we’d better figure out a way to classify cases: I don’t have time to just stand here looking for a sequence of disjoint curves for every pair you give me. Instead, I’ll make boxes for types of pairs to live in, and then I’ll say that there always EXISTS a sequence of curves (without me explicitly finding them). If I make enough boxes to deal with ALL possible pairs of curves, and I deal with all of those boxes, then I’ve proven the theorem. Even though I can count 5 intersection points between these two curves in the top picture, they minimally intersect just once, as you can see by straightening them out in the bottom picture. This means that any pair of curves will live in a box labeled by its intersection number- we have “enough” boxes to deal with whatever curves you hand me. So let’s look at these boxes. The “hole” connects our two curves to the rest of the surface (I didn’t draw it but it lives over on the right. So just take the blue curve that goes around that hole in the big surface. Label that curve a. Then the path connects x and y, with consecutive members of our sequence disjoint. So in the curve complex, there’s a path of length two between x and y. Two boxes down, just… infinitely more to go. But if I can manipulate any of my infinite boxes to fit into one of the two that we already know, I’ll be done. This is sort of the gist of the principle of induction (this is a link to wikipedia). (I will make an induction post sometime). Now suppose that . We want to reduce this to an earlier case. So let’s try to find a blue curve with a smaller intersection number with both x and y- by the principle of induction, there’ll be a path from c to x, and one from c to y. So x and y will be connected by a path, which is exactly what we want. To find c, we first make a parallel copy of x, which intersects y the same number of times (of course). So we pick two of these intersection points next to each other on y and redirect our parallel copy of x so it only intersects y once instead of twice, thus decreasing the intersection number. Look at the pictures to make this clear: x is the green curve, y is the red curve, and c is the blue curve. Our c will intersect with x once, and with y fewer times than i(x,y). That’s it! Good job team! This was some hard work but hopefully a bit fun for you- we proved that the curve complex is connected, using lots of pictures and some cold, hard logic. *Exceptions: if the surface is a once-punctured torus or a torus, then our once-punctured torus argument won’t work (the part when they intersect once and the rest of the surface is somewhere else). Same if it’s a sphere with a couple of punctures in it. These guys don’t have connected curve complexes.